Happy weekend!!! Hello from Lima-Peru again! I’ve been pretty busy the last couple of days dealing with the process of adapting my parents to the new caregiver (first ever) that will take care of dad, this is a big change for everyone at the house, not easy, but I’m working for this transition to be as simple as possible. I’m pretty tired but I feel a little bit better knowing that we have the help we need for dad to be in good condition. Today, I took my mom to the mall. I know she hasn’t done much in the last couple of weeks because of my dad’s health, she really needed some time out of the house to do her own thing. It was good to be just with her plus she kept telling me how nice it was to be out of the house “to breath some air”. My best friend came last night, we ordered pizza and talked for a couple of hours, it was nice to yack about random stuff that was not my parents situation. Tonight, I just wanted to be with my laptop, work on my blog and drink some coke. Tomorrow, I have stuff to do for my parents but I might go out for dinner with a couple of my college friends. Of course, I miss my husband, dogs and home. Hopefully I’ll go back at the end of April. Now, let’s talk about this recipe. I’m not really a fan of vanilla cake (I’m a chocolate cake person), BUT when I think of Spring/Summer cakes, vanilla and strawberry combo comes to my mind. 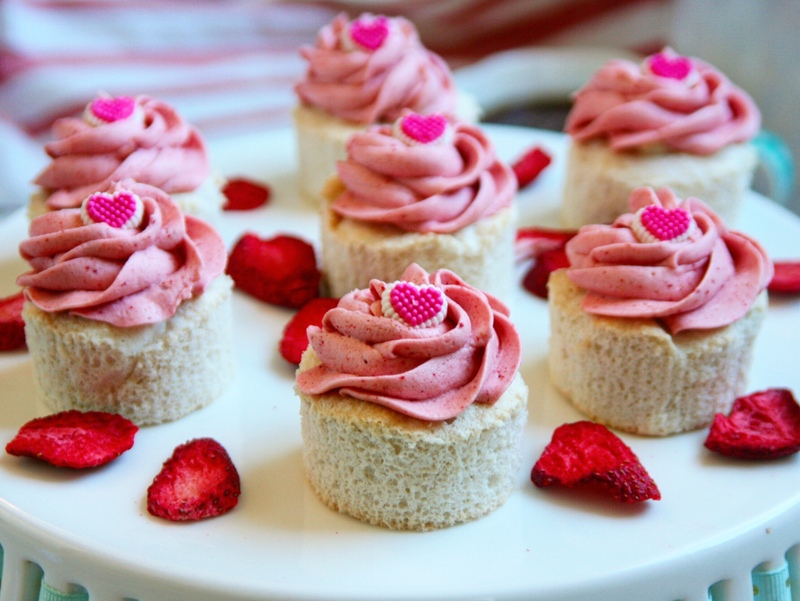 This recipe is about mini angel food cakes topped with strawberry buttercream. The buttercream is made with freeze-dried strawberries (Trader Joe’s). This entry was posted in Recipes and tagged cake, cupcakes, dessert, recipe, strawberry, summer, vanilla. Happy Monday everybody!! I’ve been MIA for about a week. I’m in Lima-Peru right now (I know…again… I was just here less than 2 months ago…) because my dad had a bad episode a week ago and I felt that the right thing to do was to travel and be with my parents. Dad is 82 and his health has not been very good lately. He suffers from depression and his body is losing strength little by little. Last week, my brother found him in pretty bad shape and had to call an ambulance to take him to the hospital, he got a pretty bad skin infection and he had to stay at the hospital for 5 days. Thing is that he really needs proper care or the healing process won’t be successful and the only people around who can help, really can’t because my mom has a short term memory issue, my oldest brother is never around (he doesn’t really care) , my brother who is always around does what he can but he can’t be his full time caregiver and I live in California with my husband. So, because of all of this, dad needs a person who comes everyday to help him in the stuff that he can’t do by himself, so here we are trying to figure out the whole situation and I’m pretty tired (emotionally and physically). My husband has been very supportive about all of this, I am very grateful that he is ok with me traveling so much because you know … traveling so far isn’t cheap plus time and plans we could have, have to be put aside for a while…but life is life and sometimes is hard! You know I love my baking and blogging so I will try to not stop doing it while I’m in Peru. So … enough with my issues (but we all know we have some…) and let’s start with the recipe!! 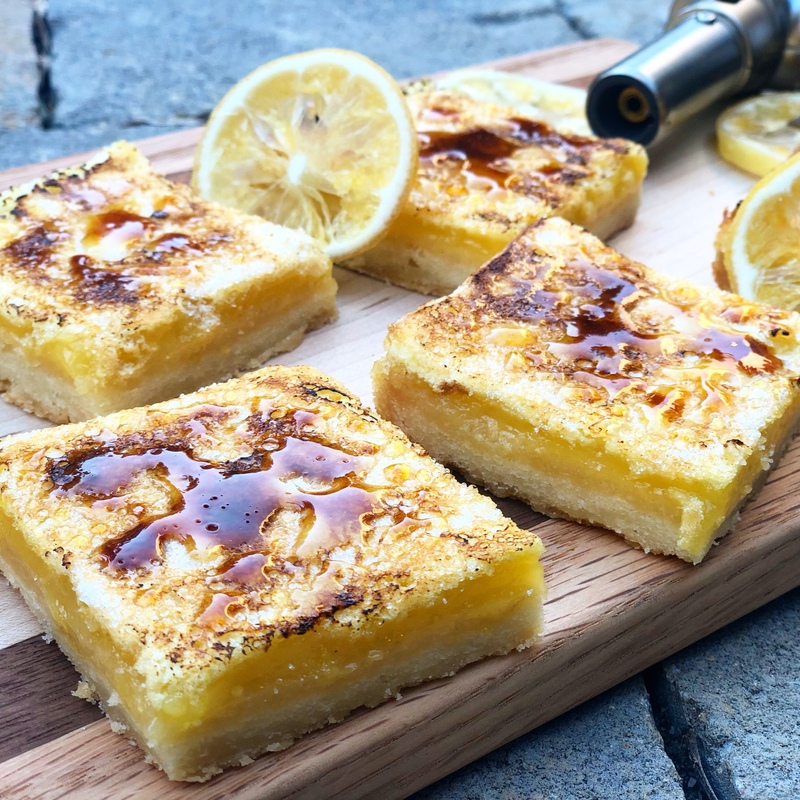 This entry was posted in Recipes and tagged brulee, brunch, lemon, lemon bars, recipe, shortbread, spring. Happy Saturday! I can’t believe this week is almost over. This week for sure hasn’t been an easy one. My husband has a terrible cold (which I’m trying not to get) and my dad’s health (who is in Peru) has gotten worse. Dad is 82 years and he has always been a stubborn person (specially now at his age). He fell 3 times this week and I was so worried that I was about to get a ticket to fly home and see him. But, things have calmed down and he seems to be a bit better now. My parents live in a big house (stairs included), so it’s a hazard for them to be going up and down the stairs, but my dad does not want to sell the house, we have talked to him many times, we found buyers for the house, but he just does NOT want to. I just pray that he’ll change his mind soon and not wait until something really bad happens to him or mom. Last night I needed a break so I went to have Chinese food with a couple of friends. It was nice to get out of the house and have some friend time and vent a little bit. This weekend is going to be warmer than usual so hopefully hubby will get better so we both can do something for Saint Patrick’s Day! 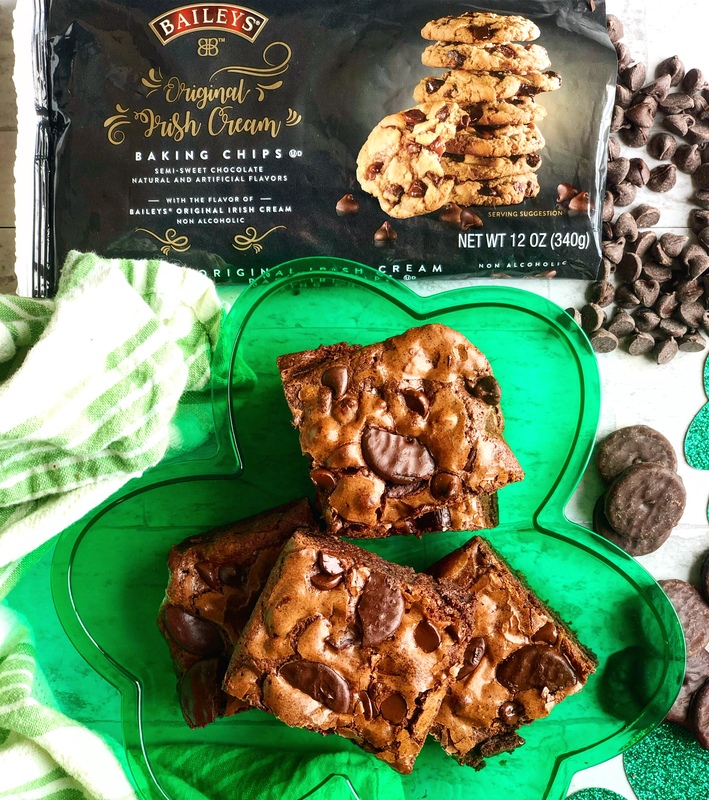 Yes, Saint Patrick’s Day is tomorrow and this recipe is perfect if you want to surprise your family and friends! Have you ever heard of Baileys Chocolate Baking Chips??? I know! Maybe you haven’t! I didn’t know about them until my friends from Clabber Girl sent me some samples to try them. I really love how they taste, and you can add those chips to your favorite baked goods! You can buy them online, I think Amazon is a good option of where to buy them. 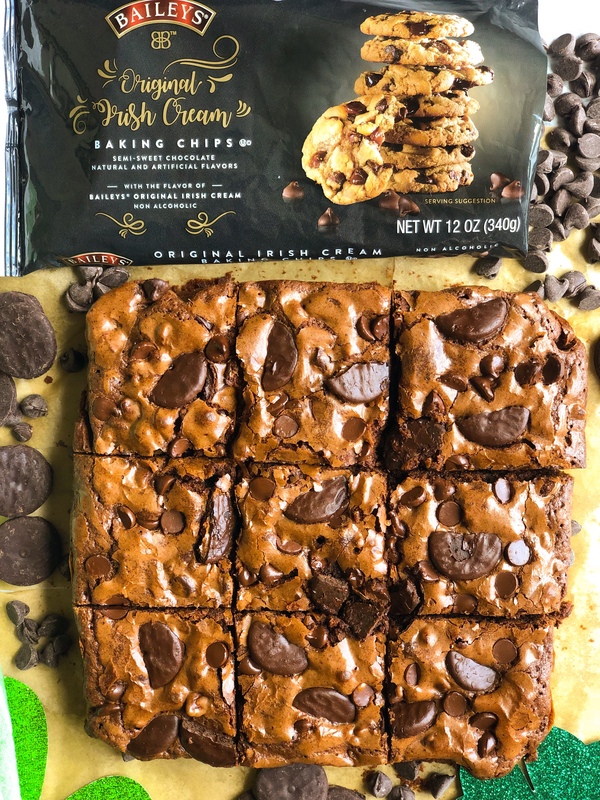 This recipe is about fudgy chocolate brownies packed with baileys chips and mini dark chocolate cookies that I got at Trader Joe’s. 1.- Preheat oven to 350 degrees F (175 degrees C). Grease an 8-inch square pan. I always line my pan with parchment paper. 3.-Bake in oven for about 25-30 minutes. Do not overcook. You will know that your brownie is done when the top gets shiny and starts to crack. Enjoy!!! Happy Saint Patrick’s Day!!! This entry was posted in Recipes and tagged Baileys, baileys chips, brownies, chocolate, mint, recipe, saint paddys day, saint patricks day. Happy Monday!! It seems that we might have Spring weather this week (finally!). I can’t wait to start wearing flip flops and shorts, I’m really done with this cold and wet weather. As some of you might know, I was born in Peru and one of the most popular grain while growing up was puffed amaranth or kiwicha (in Spanish). I really didn’t care much for it when I was young, but now that I’m an adult I know more about its nutrients. Amaranth is a good source of magnesium, iron, calcium and fiber so why not adding it to our baked goods? You can add these puffed grain to your pancakes, brownies, cakes and cookies! I had these cookies in mind for a while but I wasn’t able to find puffed amaranth at my regular grocery stores, so I got it on Amazon! It’s sold by “Erbology” and I can say that their products have good quality. So, if you can’t find puffed amaranth in regular stores, just go ahead and buy it online. 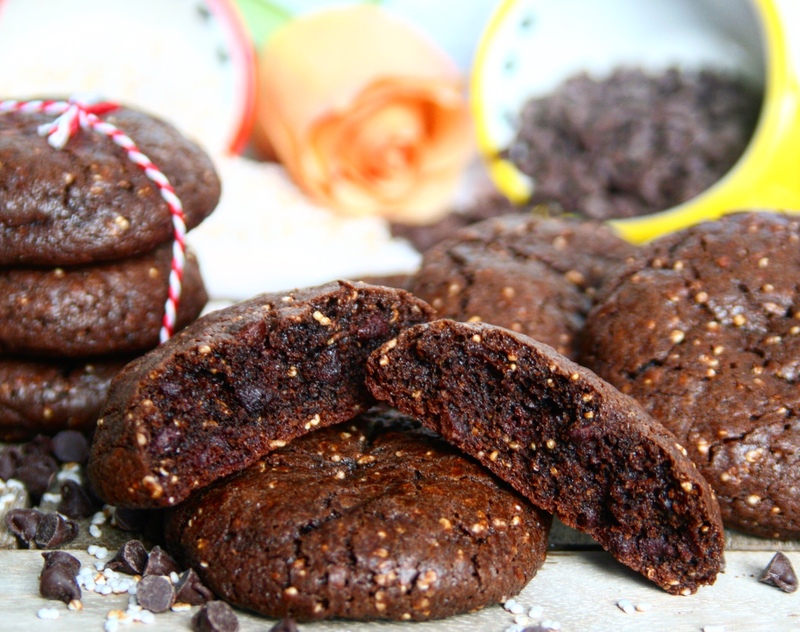 These cookies have chocolate from cacao powder and mini chocolate chips (double chocolate yay!). Also, you can taste the light crunchy amaranth that gives a toasty and nutty flavor! Ready for the recipe? Let’s start baking! This entry was posted in Recipes and tagged amaranth, cacaco powder, chocolate, chocolate chips, cookies, dessert, healthy, kiwicha. Happy Monday! I made these cupcakes a couple of weeks ago for my husband’s birthday. As most guys (I think), he likes good bourbon and bacon! I was thinking how to mix those 2 ingredients into cupcakes, so I thought about this soft chocolate bourbon cake topped with maple bourbon buttercream frosting and garnished with little pieces of crispy bacon! I told him my idea and he was like omg yes! If you are not a bacon person (like me), give this recipe a chance! 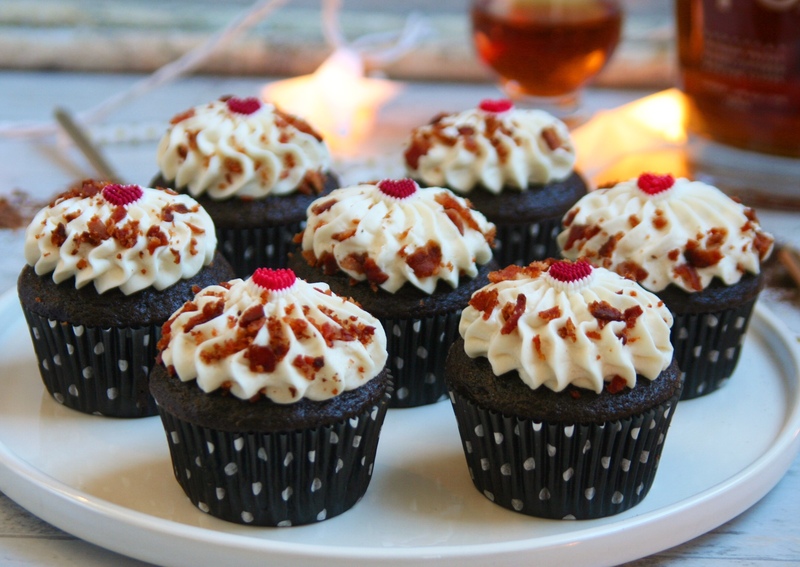 You would be very surprise how the salty bacon works so good with the chocolate, bourbon and maple! This entry was posted in Recipes and tagged bourbon, cake, chocolate, cupcakes, maple, recipe, whiskey. How is everyone doing? I just came back from the endodontist because I need a root canal retreatment. I really dislike having teeth issues, but I always had them so I’m “kinda” used to them. They will start with the retreatment tomorrow, so that’s going to be fun (aka be in pain lol). Anyway, it’s been raining a lot in Northern California and although we really needed the rain, I think we had enough. We are out of the drought, so we don’t need storms anymore. With that, I can foresee a very bad allergy season for me, time for some Zyrtec! Do you like chocolate? I love it. I think I could eat chocolate everyday, even if it’s just a tiny piece. I love plain, with nuts, with caramel, chocolate cake, chocolate cookies, you name it! I like it all! I was trying to think about a recipe for a “healthier” version of Ferrero Rocher chocolates (we love Ferrero at home). 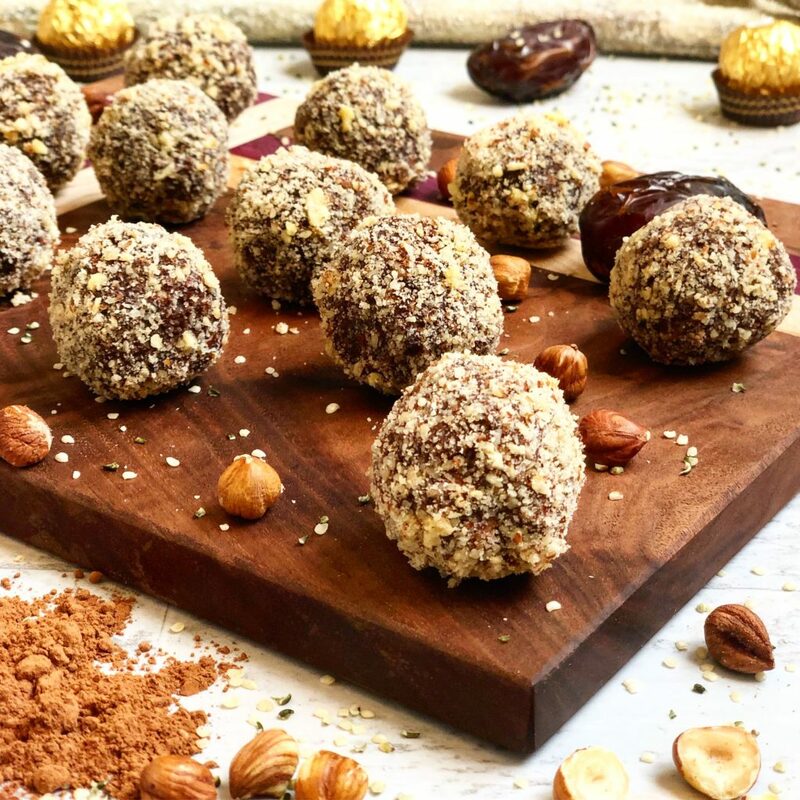 So, I came with this idea of chocolate truffles made with hazelnuts, cacao powder and sweetened with dates! This entry was posted in Recipes and tagged cacao powder, chocolate, dates, dessert, hazelnuts, healthy, recipe. Hello everyone! It’s been a while since my last post (December). I got super busy after Christmas because I was getting ready for my trip to Peru . I went to visit my parents and I just got back a 2 weeks ago. After my trip, I had to catch up with things at home, rest and decide what I was going to bake next! But, here I am, back to my kitchen and my regular blogging! Don’t forget to follow me on Instagram @pastry_tales , I try to post stuff daily. Around Christmas time, I went to a local Indian store to get some spices, one of them was green cardamom pods. For me, it was easier to find the pods than the powder. 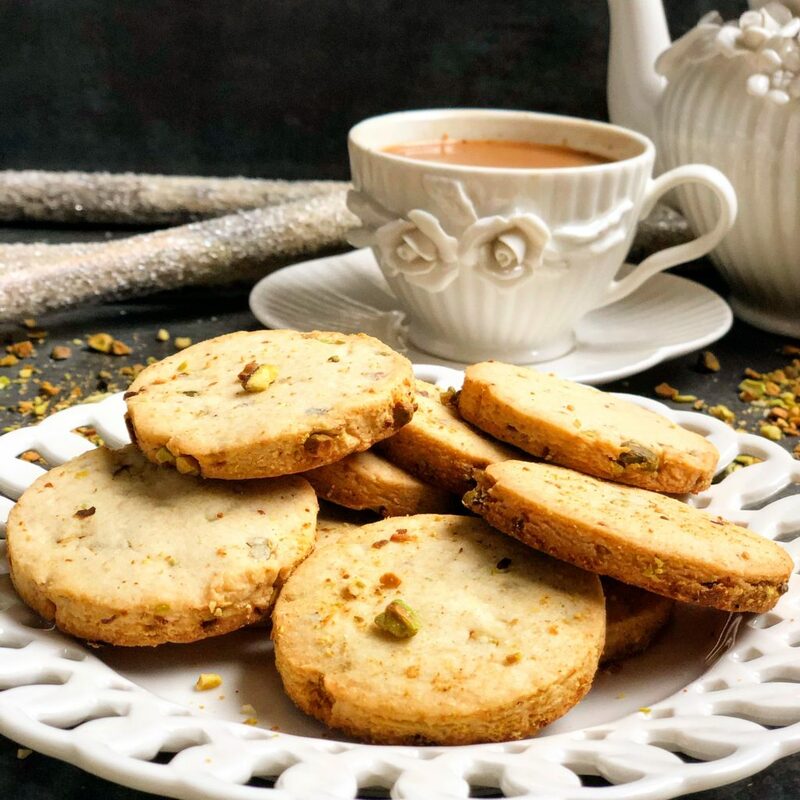 These are some kind of shortbread cookies packed with pistachios and a hint of green cardamom. 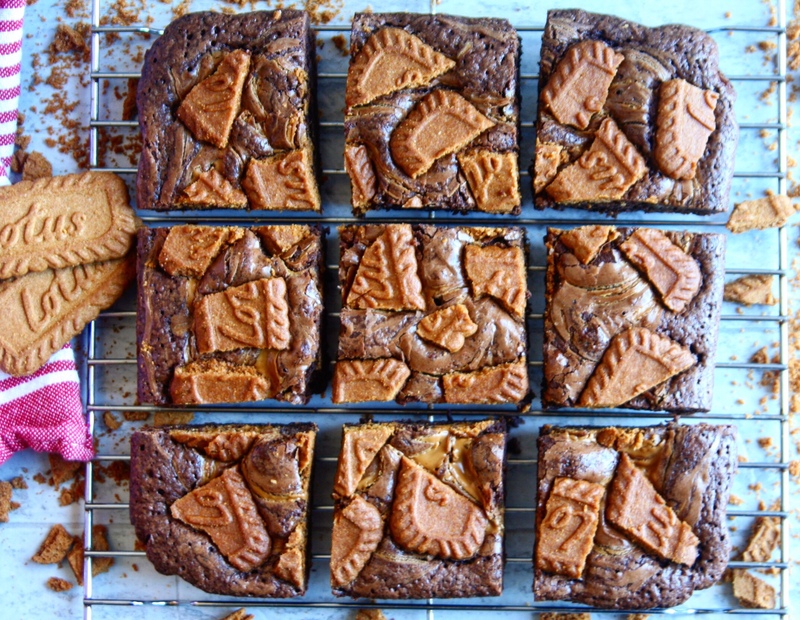 This entry was posted in Uncategorized and tagged cardamom, cookies, dessert, pistachio, recipe. Happy Wednesday!! Christmas is just around the corner and I’m still trying to figure out the menu for that day. I think we’re going to stop by Costco tomorrow so we can choose the meat for our Christmas lunch with my husband’s family. I love hosting Christmas. I always bake cookies, breads, make hot chocolate and sometimes I even come up with games. I have to start baking on Sunday morning so I can enjoy Christmas Eve with my husband too. Please, don’t take this wrong… I love baking and hosting but I also like to enjoy some free time just watching a movie with a nice cold glass of champagne. Our Christmas Eve tradition is to just chill, watch a movie, exchange gifts and wait till midnight (I always set up a Nativity, so I pray and then we go to bed). Let’s talk about these cupcakes. 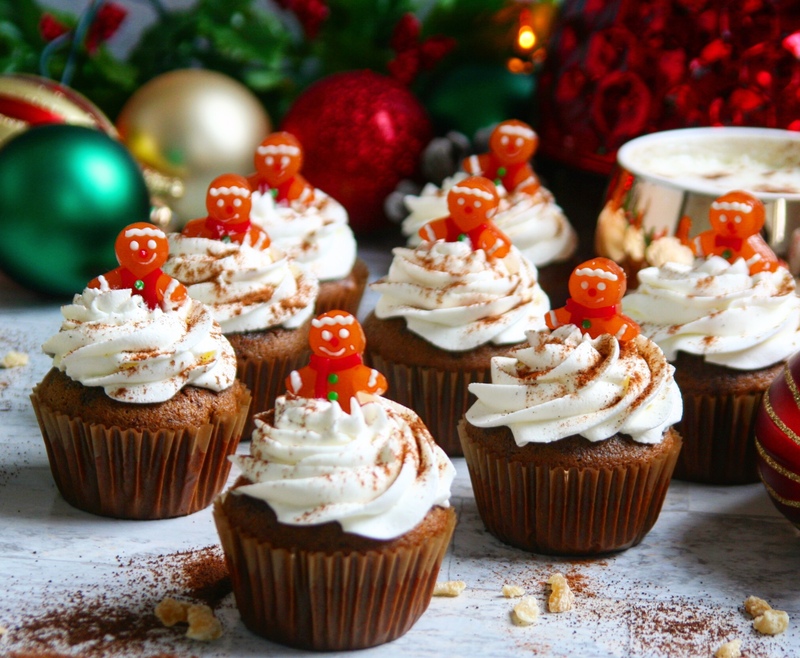 They are soft gingerbread espresso cupcakes, brushed with hot coffee and topped with homemade whipped cream frosting. These little cakes will remind you of one of your favorite holiday drinks from your favorite coffee shop “Gingerbread Latte Cupcakes”. This entry was posted in recipe and tagged cake, Christmas, cupcakes, dessert, espresso, gingerbread, latte, recipe. As some of you might know I was born in Lima-Peru (South America). My mother is one of the reasons I like baking so much. Since I was a kid, I always admired how she baked everything from scratch. If it was my birthday or Christmas or just a simple tea time with her friends, she was always a great host taking care of every little detail. Now, my mom suffers from an early stage of dementia, so baking and cooking are not a priority to her anymore, she has a person who does all those things for her. I visit my parents twice a year, but I check on them everyday with a device called “Amazon Show”, it’s a pretty cool little device, easy to use for older people who don’t manage technology very well. We can see each other and I tell them (specially my mom) about my pastries/desserts, I think that is why my blog is called “Pastry Tales”. If you are from South America or if you have ever visited, you should know that “Alfajor” is the most popular cookie down there, a very soft shortbread filled with dulce de leche, I learnt to bake this cookie when I was a kid. Thanks mom!! This year, I won’t travel to Peru for Christmas because I’ll be going in January, so I decided to make this version of alfajores called “Christmas Chocolate Alfajores”. I made the cookie with flour, cocoa powder and hazelnuts. The filling is dulce de leche and they are lightly dusted in powdered sugar. 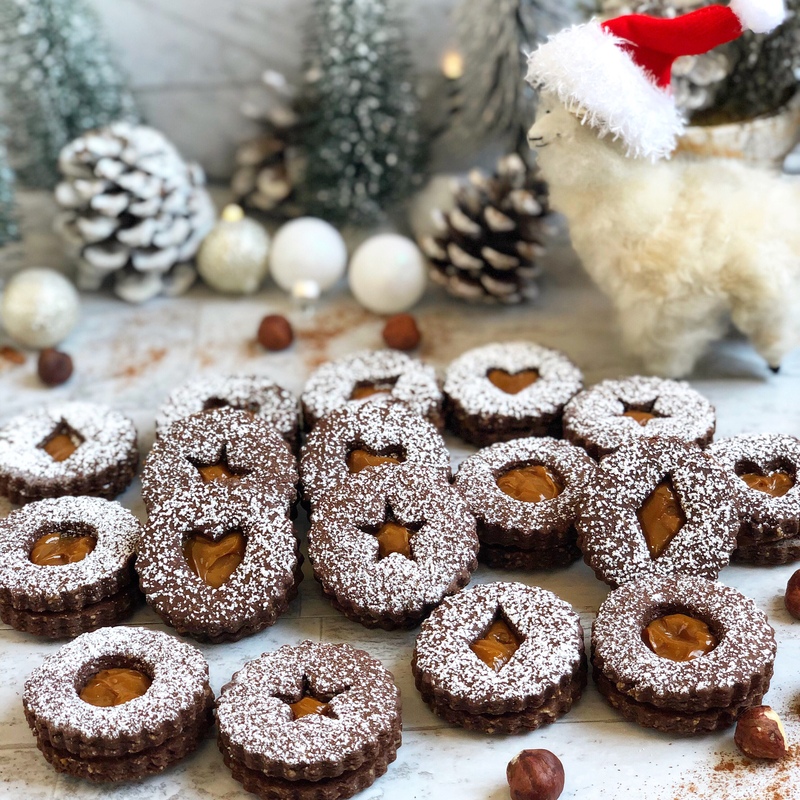 I used a Linzer Cookie Cutter Set, but if you don’t have that, you can just use a round shape one. 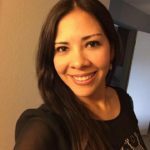 This entry was posted in Recipes and tagged alfajores, alzheimer, chocolate, Christmas, cookies, dulce de leche, hazelnuts, peruvian, recipe.